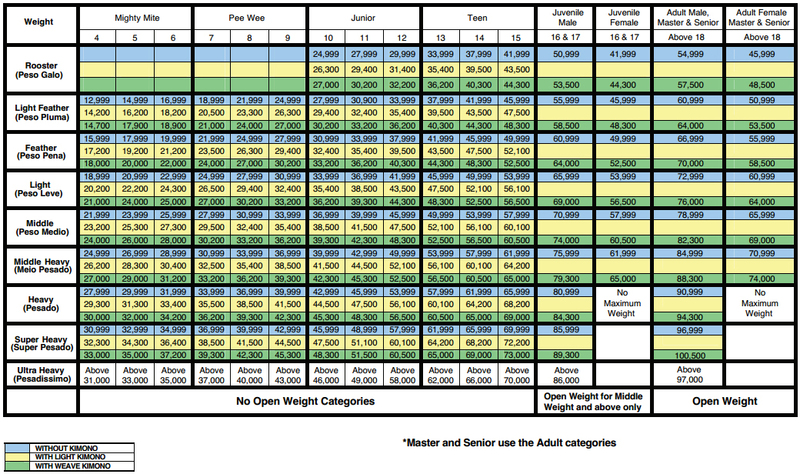 A lot of people get confused when it comes to IBJJF weight classes, especially since there are a few things you need to remember when weighing in. But have no fear, we’re here to help get that figured out for you! 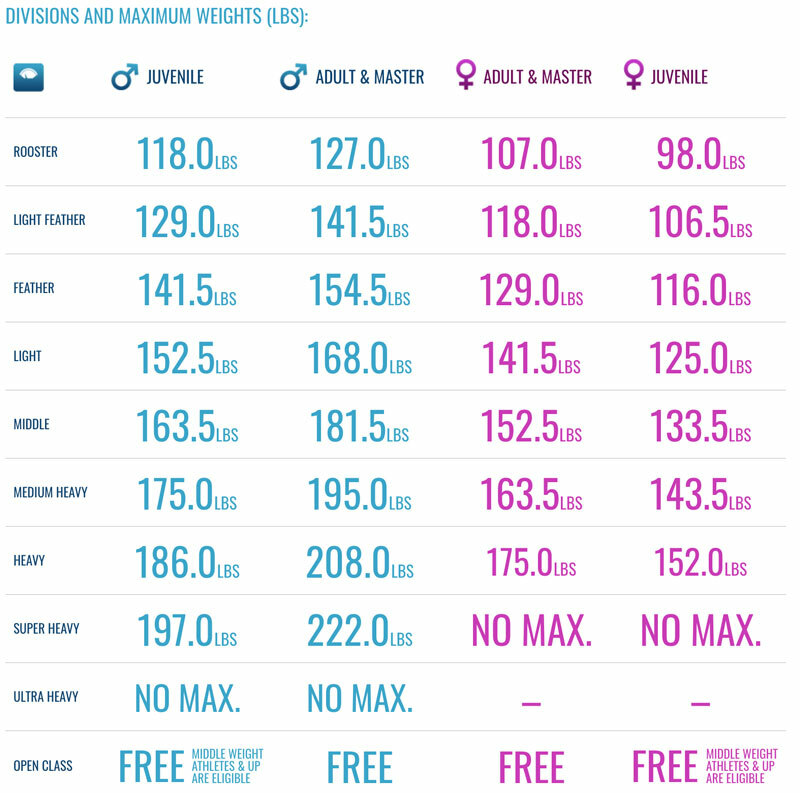 If you’re competing gi, or no-gi there are a few differences when you come to weigh in, mostly your gi is also added to your total weight, so that’s an important thing to note when you’re weighing in. According to the IBJJF website a competitor must check his or her weight before their first fight, and there will be only opportunity to do this. If a fighter does not make weight then they are automatically disqualified, so please ensure you are the correct weight before competing. While in local competition you may be able to go up a weight class, in IBJJF you will not and you will not be able to get a refund. The IBJJF are very strict with this so please ensure you are on weight. 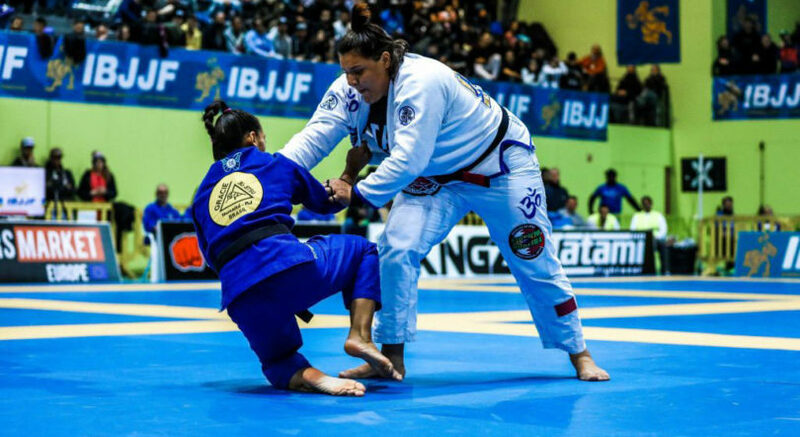 The IBJJF have decided upon a number of weight classes, which varies from Adults, Masters and Juveniles, they also differ between male and females for the Adults, Masters and Juveniles. You may not need all of the items on the list for your competition. Keep in mind that many tournaments last all day and you may have little to no notice before your bracket is called. It’s important for your body to be ready for the day ahead. Stick to clean food during competition and pig out once you’re done. You’ve earned it. This one is obvious but essential; you need to be hydrated throughout the day. You should sip your water throughout the day and sports drinks can also help with energy levels. Stay away from anything too sugary and overly caffeinated, like Redbull, I have had a bad experience with almost vomiting in a match because I downed one minutes before a match. Complex Carbohydrates digest slower and give you a great source of long-lasting energy. Nibbling on these throughout the day is a good idea, but don’t overindulge. Bananas, nuts, oats, and wholegrain cereals are great to eat and easy to pack in your kit bag. Simple Carbohydrates break down quickly and can give you a temporary boost in energy. I think it was Ryan Hall who used to eat skittles before competing as the sugar gave him a quick energy boost and the sweet flavours also helped with the cottonmouth you get when you get an adrenaline dump. Protein and fats are an important source of long-lasting energy, especially if you’re at the competition all day. Some great examples of protein for a tournament are Nuts and seeds, peanut butter, small amounts of lean meat. If you want to take supplements, stick with what your body likes. This is not a good day to experiment with pre-workouts. You will not have the kind of benefit knowing exactly when you will be on the mat. If you take a supplement and plan to be on the mat in 20 min you will likely be waiting an hour or more, and your energy will be used up by a supplement that will make you more fidgety and agitated than you would be on competition day. These are the most essential items on your list. You can’t compete without these, so double check you have what you need before you leave that front door. Don’t forget your Gi. Make sure, in advance, that your Gi fits the requirements for the tournament. Recommended Gi for competition. Perhaps the most symbolic item you can wear to your match. Make sure the one tied around your waist is yours – Recommended belts for competition. If your team is planning on all wearing the same shirt don’t forget to bring it. If you have an extra Gi and have room for it, bring it along. Your Gi might get ripped or a teammate may forget theirs and yours might fit. Cheap BJJ Gis, perfect for a backup. Good to have an extra pair in case you have a wardrobe malfunction. This one is also mostly for the ladies, and the guys with the pretty hair. 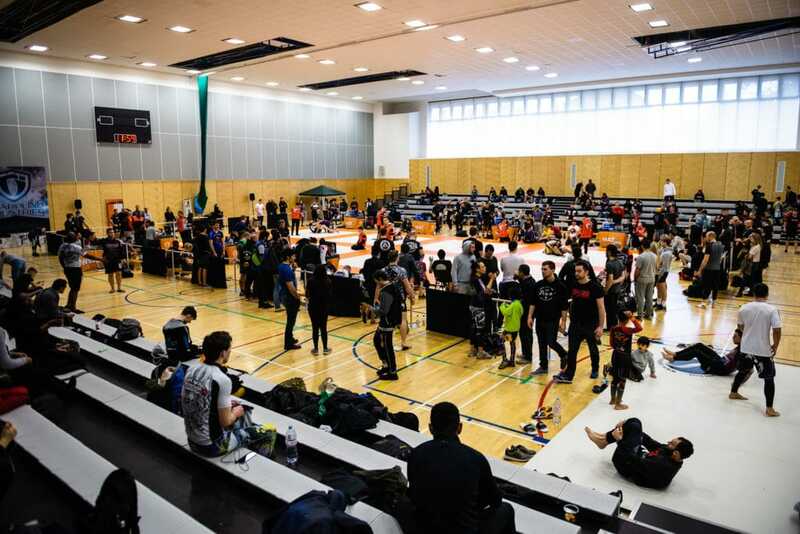 If you’re competing for at an IBJJF competition, you will need your registration card. Plan on being at the tournament all day, you won’t get too stressed out. If you bring any guests to the tournament you should do what you can to make them comfortable. It may sound odd but a pillow has a place at a BJJ tournament. Many competitors do not sleep well the night before the tournament. They then get to the tournament first thing in the morning, to find out their bracket will not hit the mats until later in the evening. Taking a little nap is a great way to pass the time and calm down. You may also get tired of sitting on hard bleachers all day and a pillow will offer you a little extra padding. If you are planning to take a nap bring a small blanket. This can also be used to make the bleachers more comfortable. Especially for nogi, throw on a hoodie on after warming up to keep you from cooling down. If the building is cold, you would be glad you brought your hoodie. If you’re one of those people who doesn’t like to watch others compete because it makes them nervous? A good book is a great way to take your mind off the action. Flip flops or any quick shoe will help you get on and off the mat without slowing you down. This is especially important if you need the toilet between matches. At some tournaments finding a place to sit is just as hard as getting a medal. Stay ahead of the competition by bring your own folding chair. Once your day is done, there’s nothing worse than travelling home wearing sweaty, moist underwear. Bring a spare pair and get comfortable. Hopefully, you won’t need these items, but if do you’ll be glad you have them. Be ready to share your medical supplies with any teammates or competitors who might get hurt. Keep your open injuries clean and help prevent getting blood on people. It is also a good idea to bring some 4×4 gauze pads too. If you wear contact lenses be ready for any troubles they may give you. Put a little Neosporin on any cuts or abrasions before you bandage them up. Washing your hands if better but not always practical. You know what you need, just don’t leave it at home. Keep a couple of icepacks handy, in case you or your teammates need to ice any sprains or pains. Here are some extra items we think would be useful for you. Win or lose it is a good idea to have someone record your matches. Don’t forget to get a team picture before people start leaving. It’s hard to hold a video camera and cheer someone on at the same time. Usually, the video suffers, more than the cheering. If you happen to be at the tournament by yourself set up your camera and hit record just before the match starts. Make sure you have all your teammates numbers in your phone and keep it on you until you are getting ready to hit the mat. You don’t want to miss your buddies’ match because you went to the restroom. Set up a group message on whatsapp and keep each other informed. Your friends and family that are not at the tournament will also be trying to get in contact with you to see how you did. Your phone can also double up as a camera to record yours or your friends’ matches. If you’re on your phone all day, recording matches, listening to music, talking to teammates, it may be a good idea to bring along a portable charging brick and your charging cable. You may want to get some gear, clothing, or food. There may be some great deals at some of the vendors. You should know the rules, but you might need to look up what is legal for a teammate of a different skill level.